We will have your windows clean & clear on both sides! As well as cleaning windows, we also provide our customers with an internal window cleaning service. Often when windows have been cleaned, this highlights fingerprints and smears on the inside of the glass. Due to the build up of film on the inside of the glass the best way to clean internal windows is with a traditional blade and squeegee application and not with a spray and cloth, as this only smears the dirt into the corners. 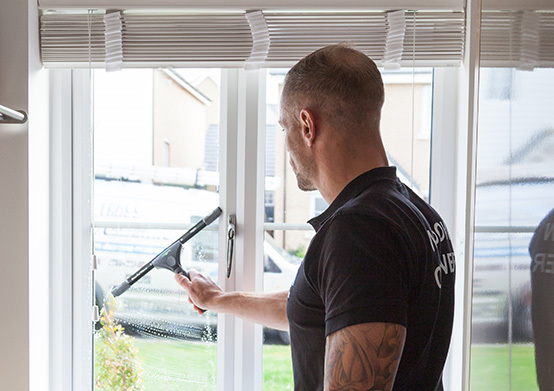 The only thing we ask of our customers is that they clear the sills & surfaces near the internal windows being cleaned so the operators are able to reach them without any problems and with no risk of damaging your property. During this service a professional will use an applicator to apply soap to your windows, being thorough enough to get into the corners of your windows where dirt hides. After using a squeegee to remove the soap, we then dry the sides of the window, and polish out any smears. The window is given a final inspection to make sure that it is perfect. We then wipe up any water left behind so that your window sills are left clean and dry. We then move onto the next window. 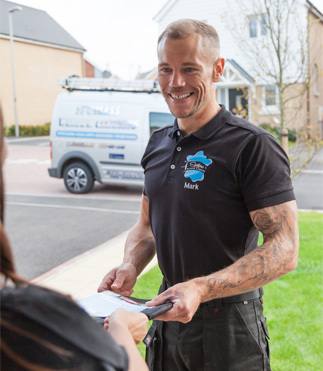 Once we complete our service, we then carry out a final inspection of all of your windows, so that we are happy that all of your windows have been cleaned to a high standard. It is at this point, once we are happy with the standard that we give you our satisfaction guarantee. Recommendation – twice a year – ask about our regular cleaning schedule.